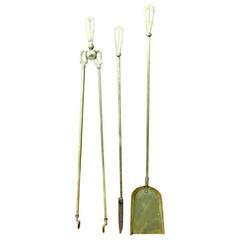 A set of four Arts & Crafts hand forged fire utensils on a hand forged iron stand. 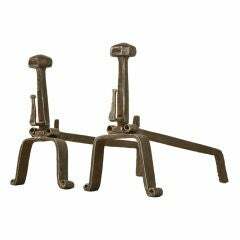 These hand forged wall candleholders were produced in France, circa 1950s. 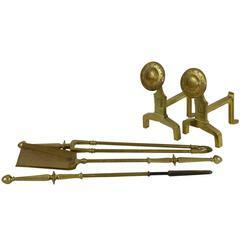 A set of three Arts and Crafts brass fire utensils. Measures: Poker length 27&quot;. Spade length 29&quot;, width 4.75&quot;. Tongs length 28&quot;. 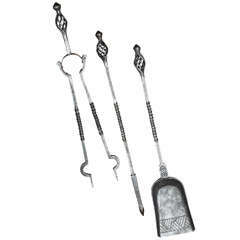 Set of three English Arts and Crafts steel fire tools, the handles with open spirals over square shafts having barley twist cnters, the solid shovel with etched decoration. 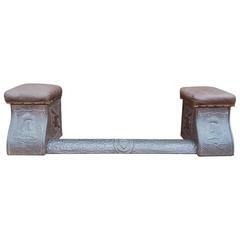 Hand-forged five-piece iron fire tools with wonderful patina.